I made this recipe today for the second time. It is so good, and so light. It's probably more like cake than a donut as it is baked. I am always happy to find gluten-free recipes that are tasty and easy. Jeanine Friesen has many wonderful recipes, and this is one of her best. If you are gluten-free and haven't found her Faithfully Gluten-free site, I highly recommend it. These donuts are so sweet and good! I hope you like it....my husband and I love these donuts. I used fresh strawberries from our local farmer's market in the donuts and for the glaze. I had enough dough to do a couple of mini-loaves as well. They looked pretty good before I put the glaze on. 1Preheat the oven to 375 degrees F ( degrees C). Lightly grease a six cavity doughnut pan. 2Whisk together the rice flour, tapioca starch, sugar, baking powder, baking soda, xanthan gum, and salt. 3In a separate bowl, whisk together the eggs, oil, sour cream, and vanilla. 4Pour the wet ingredients over the dry, and stir to combine. Stir in the finely chopped strawberries. 5Scrape the batter into a large resealable plastic bag or piping bag. Cut off one corner, and pipe the batter into the prepared doughnut pan. 6Bake in the preheated oven for 10-12 minutes, or until the tops spring back when gently pressed. 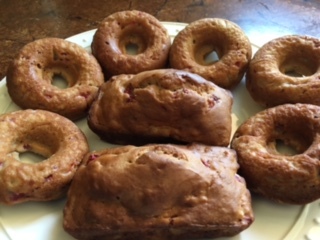 7Allow the doughnuts to stay in the pan for about 5 minutes, before carefully removing them to a cooling rack. Allow the doughnuts to cool while you prepare the glaze. 1Measure out 2 tablespoons of mashed strawberries. Stir this into the Confectioners' sugar so that no lumps remain. To get a nice consistency with the glaze, microwave it for about 30 seconds to heat it slightly before dipping the doughnuts into the glaze. They do not look gluten free at all. It's also nice to see fresh strawberries in the glaze. Love this one! I know I could eat them all at one sitting. They look terrific and are nit at all fattening. The more you eat the more weight you lose:-) A perfect treat. 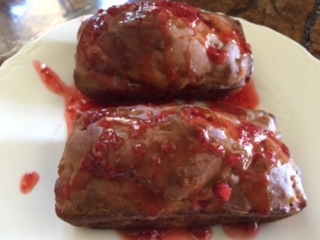 I know that Lucy would want to get some potato flakes in there, with some YW and drop the gum since we don't have any, Strawberry yeast water would be perfect for this recipe and then you could drop the baking sod and powder too making it chemical free! Well done and happy baking Phyllis. They look super tasty. Just so you know, it's a scientific fact that if you cut donuts in half and tell yourself you are only going to eat one more half, all of the calories fall out.